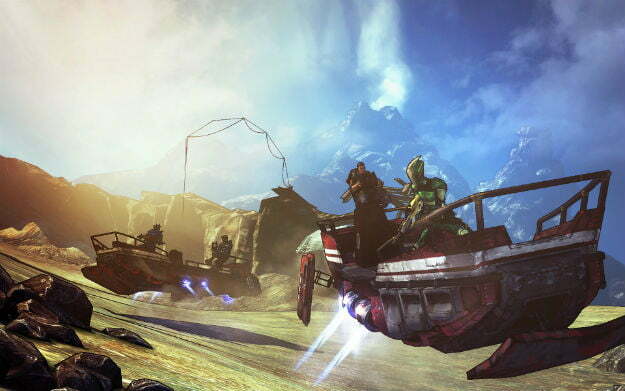 Borderlands 2 is not an exciting game. That’s not a slight. It has some tense shoot-outs, certainly, and there are passages when the action gets frantic (especially with a team of 4 raiding a bandit camp), but it is not a fast-paced, surprise-a-minute affair. This is a game where you habitually stop in the middle of a gun-fight to see if a Port-o-john is hiding a superior shield while your friends take potshots at psychotic freaks dressed like the Teenage Mutant Ninja Turtles. 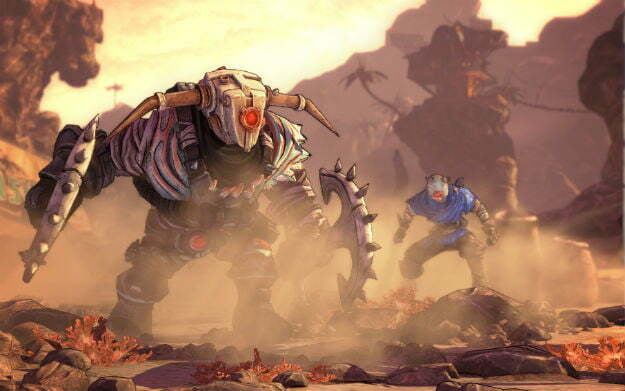 Gearbox Software’s game is comfortable, a pair of well-worn sweatpants, and each new environment, each new enemy, gun, and caricature character is something smooth to slip into and while away a few hours of gaming pleasure. Hence why the game’s first downloadable content, Captain Scarlett and Her Pirate’s Booty, is so instantly likable in a sample size: It’s another serving of comfort food. I settled into Oasis, the DLC pack’s desert setting in the same demo session as when I got to take the new Mechromancer, Gaige, for a spin. After an hour in the new region—Gearbox told me the DLC campaign will last around 8 hours—I found that I could have happily spent the rest of the afternoon devouring the setting. Oasis is a dead city, a place that was supposed to be a tourist destination on the planet Pandora, but the desert was a little too powerful and its citizens died of thirst. The only exception is Shade, an unhinged blighter that’ll worship the vault hunter under your control when they roll into town. Shade’s a weird character for Gearbox’s team, insofar as he’s just as wacky as every other character you meet on Pandora, but he’s not a terribly effective pop culture gag. Shade looks identical to gonzo journalist Hunter S. Thompson in his Fear and Loathing In Las Vegas guise: Giant yellow aviators, cigarette holder, Hawaiian shirt, fishing hat, mild insanity, etc. He’s a lonely coward rather than an aggressive, drugged-up lunatic, though, so there’s some cognitive dissonance in the pop reference, which shows the writing in Pirate’s Booty may not have gotten the same time and attention the main campaign’s did. Once you’re out in the desert, you meet Scarlett and her crew on her ship. She makes the sort of flippant remarks about your potential death on a quest as well as some token gags about being a pirate. (“I’m trying out catch phrases! 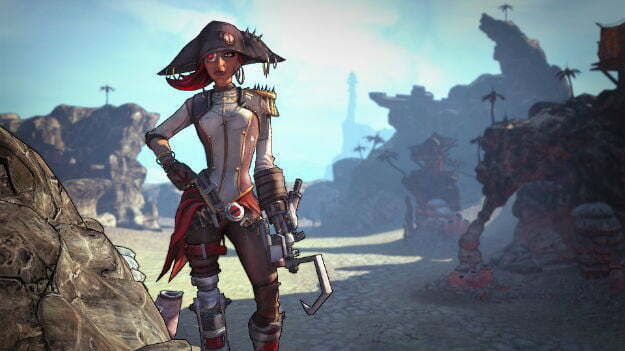 Arrr matey!”) Scarlett’s another character that makes the DLC’s writing feel like a collection of Borderlands B-sides rather than A-material, but it’s fine enough. The first mission she sends you, a dungeon raid that has you stealing back a map from her old pirate partner, is more of what you get in the main game spiced up by some tricky new pirate enemy types. The underground lair reveals the desert’s real oasis, a watery paradise of flowers and pools and, naturally, enemies with guns. The most dangerous of the new enemies is a ghost pirate type who will drain your health as he advances on you. Second to him is a boss character that can toss an anchor at you and drag you in for a brutal melee strike. Outside of the aesthetic and enemies, it’s the same old thing. Push into the dungeon, kill the boss, get the item, return for a new quest. In other words, it’s another familiar serving of Borderlands’ signature comfort food. For anyone that’s maxed out every character class already, the pack is well worth the price of admission. For anyone still luxuriating in the game’s campaign, though, this sample shows that Pirate’s Booty is solid but inessential stuff. Check back with us tomorrow for a full review of the complete DLC.